1 quart – For producing light, hollow, unbreakable casts. 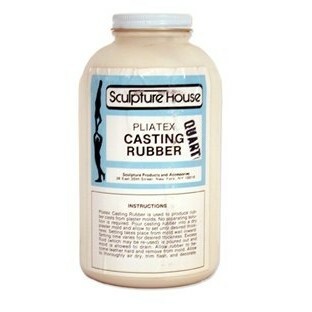 Casting Rubber and Casting Filler (liquid) are mixed and poured into ordinary plaster molds to create a positive rubber cast. Casts may possess any degree of flexibility or can be entirely rigid, depending on the proportion of filler used. Made in U.S.A. Please fill out your shipping invoice, and we will calculate the UPS shipping rate and send you an email with the total, as well as email you a PayPal Invoice you can pay for your order online with a Credit Card, or call with your Credit Card info., or send us your phone # and let us know the best time to call you for your Credit Card info., or fax or email us a school Purchase Order (P.O.’s for schools in the USA and Canada only) to process your order. We send you the Tracking # after shipping. NOTE: OUR WEBSITE IS CHANGING AND WE WILL HAVE AUTOMATED SHIPPING FOR THESE PRODUCTS SOON! Shipping weights are approximate, and prices are subject to change without notice. If there is a price change, you will be notified before payment. Thank you while we complete these updates.